Productivity isn't a word usually associated with forever-in-the-red Air India. Civil servants on deputation to the top position in the airline have, however, been raking in fat cash incentives and free tickets from the lossmaking behemoth. The Ministry of Civil Aviation appears to have given its blessings in certain cases to institutionalize the mechanism for these officials-all from the elite Indian Administrative Service-to avail of performance-linked incentives (PLI) which are meant essentially for regular employees and that too when it is making a profit. Free passages-business or first class-have also been a free-for-all zone, with two CMDs of recent times scoring healthy centuries. P.C. Sen, an IAS officer on deputation as both Chairman and Managing Director of Indian Airlines as well as Chairman of Air India between October 1995 and December 1998, even took the Department of Personnel and Training to court, seeking free passage entitlement after repatriation to his parent service. In its July 2006 order, the Delhi High Court found the petition "devoid of merit" and dismissed it. "At a time when oil prices are spiraling, (and the world faces a grave energy crisis, which has constantly led all societies to rethink and revise tariffs in all modes of transport), the extension of such unlimited and unregulated "air passage" facility even to a section of the people, howsoever eminent they might be, and howsoever loyal their services might have been, in a developing country that can ill afford it, has to be reviewed," the court said. and Indian Revenue Service officers on deputation to AI have also milked the free passage cow, almost all making liberal use of it (see accompanying box). One such Chief Vigilance Officer used 199 free passages in five years, or 40 every year. That's almost once every week. Official documents accessed by MAIL TODAY show that then Indian Airlines CMD Vishwapati Trivedi who became joint MD of the airline after the merger with AI took home Rs.8.55 lakh as productivity linked incentive (PLI) during his tenure (2006-2008). Trivedi is now Secretary in the Shipping Ministry. In 2006, the monthly salary of Trivedi was Rs.60,076, the take-home component coming to Rs.41,626. Trivedi told MAIL TODAY that he was entitled to PLI from Indian Airlines as this was mentioned in his appointment letter issued by the Ministry of Civil Aviation in consultation with the Department of Public Enterprises. Trivedi's appointment letter links his medical concessions, LTC, Group insurance and other facilities to the All India Service Rules but at the same time makes him eligible for PLI introduced by the Indian Airlines during his term. Air India MD V. Thulasidas collected an even fatter cheque of Rs.25.13 lakh as his PLI amount during his tenure as AI chief (December 2003 to March 2008). Raghu Menon, CMD between April 2008 and June 2009, got a PLI allowance of Rs.11.01 lakh. Interestingly, the ambiguous nature of this PLI becomes quite evident as Anil Baijal and Sunil Arora, both IAS officers who were CMDs of Air India just before Trivedi and Thulasidas served their term did not claim any PLI. Baijal told MAIL TODAY, "I was not entitled to PLI as I was on deputation to Indian Airlines. So there was no question of getting PLI from the airline." Similarly, after Raghu Menon, Arvind Jadhav did not avail of PLI. Present CMD Rohit Nandan is also not taking PLI from the airline. Official documents also reveal that P.C. Sen was the first IAS officer to get the PLI benefit when he was on deputation to Indian Airlines between 1995 and 1998 after getting a special amendment to his entitlement conditions as member of the All India Services. Sen took home Rs.7.77 lakh as PLI from the airline. The Comptroller and Auditor General (CAG) had in a report in 2011 pulled up Air India for violating official norms to dole out PLI to its employees for many years despite being a loss-making entity. The norms of the Department of Public Enterprises clearly state that not more than 5 per cent of the profit can be given as an incentive to employees while AI has been dishing out the incentive despite making losses. The CAG had observed that the national carrier did not follow any set procedure for pay revision or fixing of the PLI. It also found the AI board guilty of raising various allowances, including PLIs, by up to 50 per cent from January 2005 even though the loss-making firm depended on loans even to meet its working capital requirements. The company made excess payments as PLI amounting to a whopping Rs.315.78 crore in 2007-08 and 2008-09. Ironically, despite the inflated wage bill, PLI was never linked to productivity since its introduction in the 1990s. As profits dipped and the carrier did not get any additional revenue, employees got richer with PLI, which touched almost 60 per cent. Amazingly, the heads of Indian Airlines received the incentive payouts when the total payment under the PLI by the airline to all employees often exceeded its losses in that year. 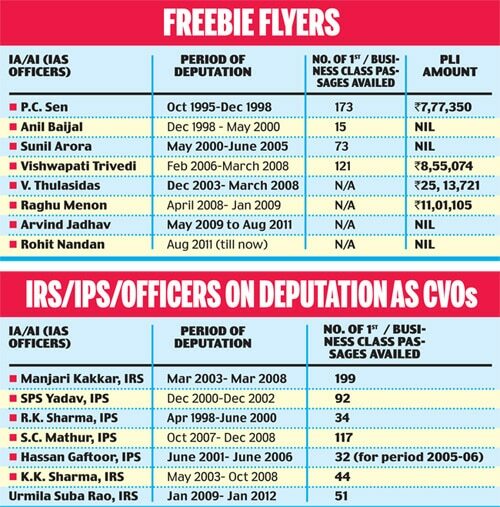 When Trivedi was CMD, Indian Airlines during 2006-2008, paid almost half of its Rs.3,000 crore total wage bill as PLI to its 31,000 employees. The staff: aircraft ratio was 230:1 as against just about half that number in any other international or domestic airline. It is now at around 180:1. AI's wage and fuel bill constitutes nearly 60 per cent of its total costs against 35-40 per cent in case of others. Air India which paid salaries under two heads-one related to salary and another PLI till March -has paid April salaries under one head called 'salary plus ad hoc previous month', the latter replacing PLI. While employees up to deputy managers get up to Rs.12,000 to Rs.15,000, it actually shoots up much higher from the rank of manager and above which is in the range of Rs.28,000 to Rs.55,000. Air India, once the Maharaja of Indian skies, has now come to a sorry pass with its a market share dwindling to a mere 18 per cent falling behind newly launched airlines Indigo and Jet Airways. Policy watch: Air-India goes into a free fall, but is nobody to be blamed?